I’m a sucker for a good muffin. 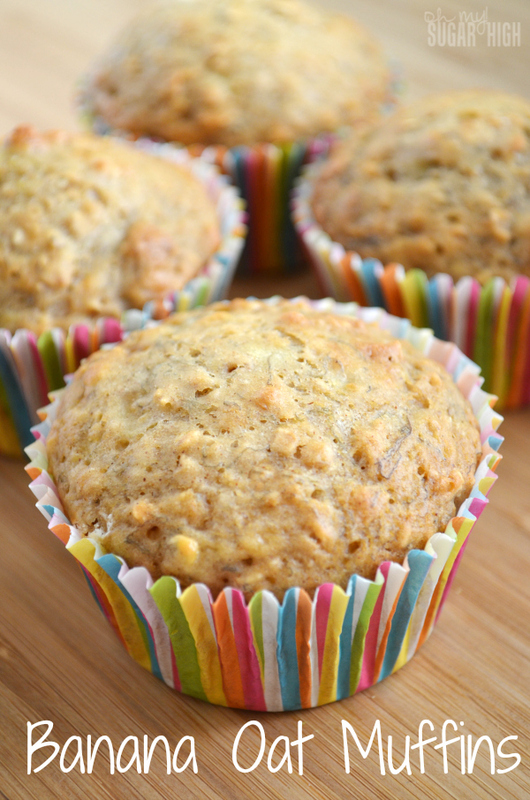 And while I love muffins with a crumb topping, I can also appreciate a healthier alternative. 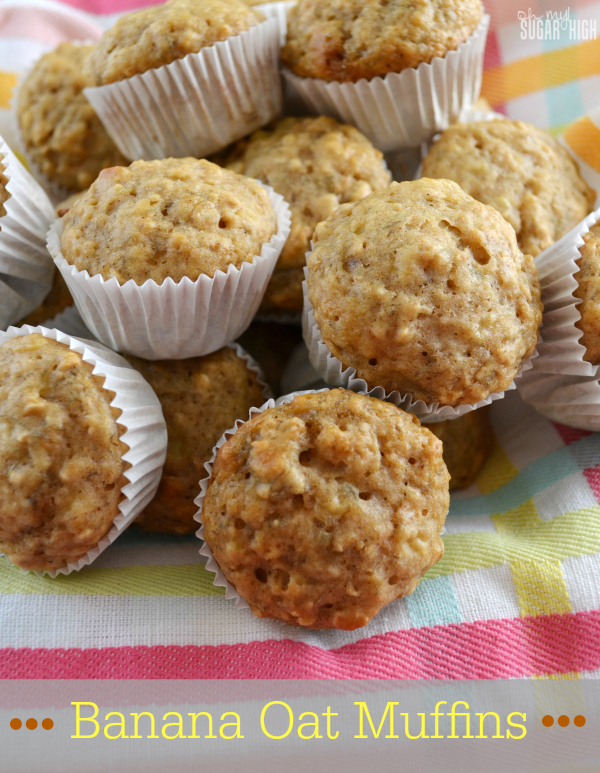 These banana oat muffins are a great choice for a quick breakfast on the go. They are filling and taste great with a cup of coffee. If you want to take things up a notch, consider whole wheat flour or even adding a few mini chocolate chips or nuts. I made 24 mini muffins, but because I only have one mini muffin pan, I was able to make 9 additional full sized muffins as well. I love mini muffins for my kids. They are just the right size for them to have several, but I can eliminate the potential waste when they can’t finish one or I feel they’ve had enough. In large bowl, combine flour, oats, sugars, baking powder, soda, salt, cinnamon and nutmeg. In a large bowl, beat the egg lightly. Slowly whisk in milk, oil, and vanilla. Add the mashed banana, and mix until combined. Stir the flour mixture into the banana mixture until just combined. 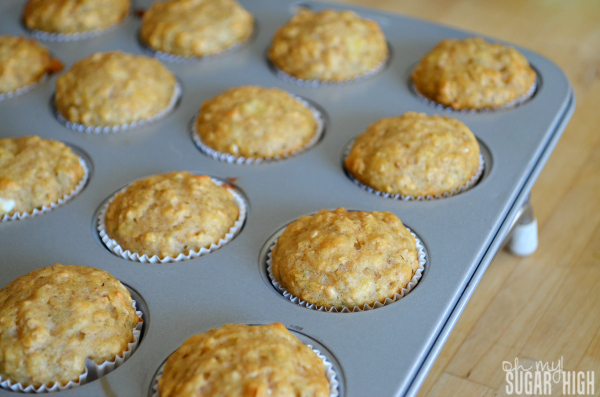 Line a 12-cup muffin tin with paper bake cups, and divide the batter among them. Bake mini muffins for 10-13 minutes and/or full size for 18 to 20 minutes or until toothpick inserted in center comes out clean. Cool in pan for a couple of minutes before transferring to wire rack to cool. Because there isn’t a lot of color to this muffin, I highly recommend using some baking liners in fun colors. I wish I had for my mini muffins after seeing how fun my full sized muffins looked with their rainbow colored cups. Hmmmm… a must try! Got you from Lakeshore Drive. Pinned this too!